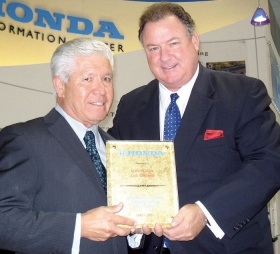 S. Robert Zamora, left, of Lodi Honda in Lodi, Calif., receives a 30-year award for Honda from Marc Thomas, American Honda Motor Co. district sales manager. 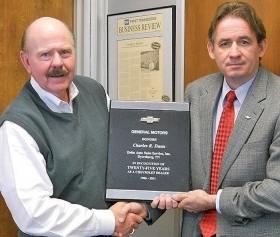 Charles Dunn, left, of Delta Autoplex in Dyersburg, Tenn., receives a 25-year award for Chevrolet from Grant Lindsay, Chevrolet zone manager. 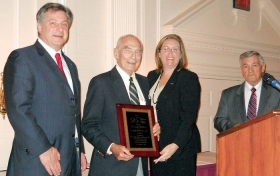 Carl Touhey, owner of Orange Motor Co. (Ford-Mazda) in Albany, N.Y., receives a 95-year plaque for Ford. The dealership, opened by Touhey's father, Charles, in 1916, also has sold Mazdas for 28 years. Pictured from left are Michael Fornari, Mazda North American Operations district sales manager; Carl Touhey; Carol Huban, Ford Motor Co. zone manager; and Carl Keegan, vice president.